In 1994, a researcher was smuggled one top-secret photo the Hubble Space Telescope had taken of what is presumed to be Heaven. 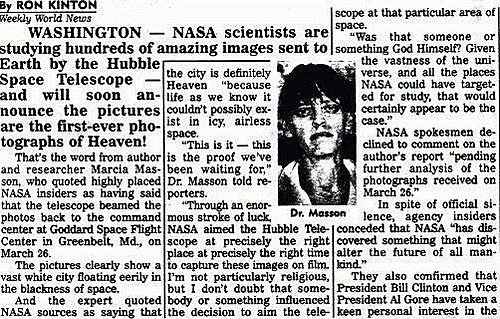 Weekly World News was the first to print the image and report on Dr. Masson's findings, but despite the media coverage, NASA refused to acknowledge the existence of the photo. 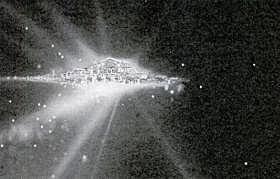 Now that the Hubble has been repaired and NASA is officially releasing some of it's new findings, the Weekly World News editorial team believes it is NASA’s responsibility to further investigate this space anomaly! That's the word from author and researcher Marcia Masson, who quoted highly places NASA insiders as having said that the telescope beamed hundreds of photos back to the command center at Goddard Space Flight Center in Greenbelt, Md., on December 26. And the expert quoted NASA sources as saying that the city is definitely Heaven “because life as we know it couldn't possibly exist in icy, airless space. “This is it – this is the proof we've been waiting for,”Dr. Masson told reporters. “Through an enormous stroke of luck, NASA aimed the Hubble Telescope at precisely the right place at precisely the right time to capture these images on film. 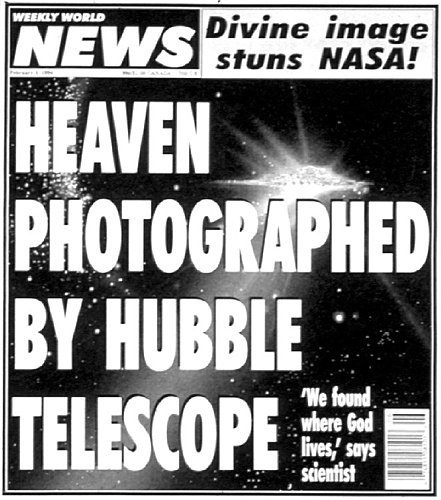 I'm not particularly religious, but I don't doubt that somebody or something influenced the decision to aim the telescope at that particular area of space. “As adjustments were made and the focus sharpened, NASA analysts couldn't believe their eyes. 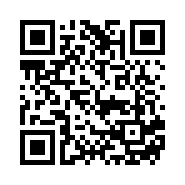 “After checking and rechecking the data, they concluded that the images were authentic. They also theorized that the city couldn't possibly be inhabited by life as we know it.